Hi mates! I have problems with iOS Localization. I followed this guide to insert localization strings in my app. but doesn't work. I'm getting the key when going to show the translation. I'm working with iPhoneSimulator and Visual Studio 2015. Could give me some help to solve this? I'm tried everything to solve, but still blocked . I had to create Resource Folders with type "BundleResource". I could check it taking a look in .csproj file. My advice, avoid localization inside of platform. I've tried with a helper translate extension method I found on another thread here, but again it didn't work. My .lproj files are all with BundleResource build action, so I am lost. Do you have any other ideas I could try? 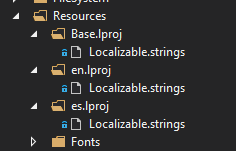 What do you mean "Resource Folders with type "BundleResource""? I doesn't recommend that. No coverage and lower version 1. For production not the best choice. @Marcel_Be what it's the real problem? @josemmortega For me the main problem is nuget version lower 1 (0.6.0). For me it means, it is under development. But the last commit was one year ago. But that's just my opinion and why I wouldn't use it. It's your only reason @Marcel_Be, version number? Idk, I use this library in production and work really well. Thanks for you comments on I18n-portable library. The coverage is actually greater than 99%, however codecov.io doesn´t seam to be working at the moment. You may clone the project and run the test suite by yourself before doing such statements. This library is being used my many people on production (me included) without issues. The reason for the version being less than 1 is that I had plans to implement more features but I decided to keep it simple instead. Anyway you are right, it might change to a 1.0 version soon, as I´m planing to create some handy tools like static reference keys.